Ground floor apartment with 3 bed / 1 bath and 2 east facing terraces for sale in Pueblo Indalo, Mojacar Playa, Almeria, Andalusia. The apartment comprises of 3 furnished bedrooms, 1 complete family bathroom with shower and 2 toilets, the kitchen is modern and fully fitted and equipped with high quality white goods, semi new. Lounge - diner with dining area and access to the terrace. The terraces measure 18 m2. The property is being sold fully furnished with excellent quality furniture and ready to move into. There is air conditioning / heating and you can put a BBQ on the terrace. Includes a storeroom, on the same floor as the apartment, of 17 m2 plus an outdoor parking space. 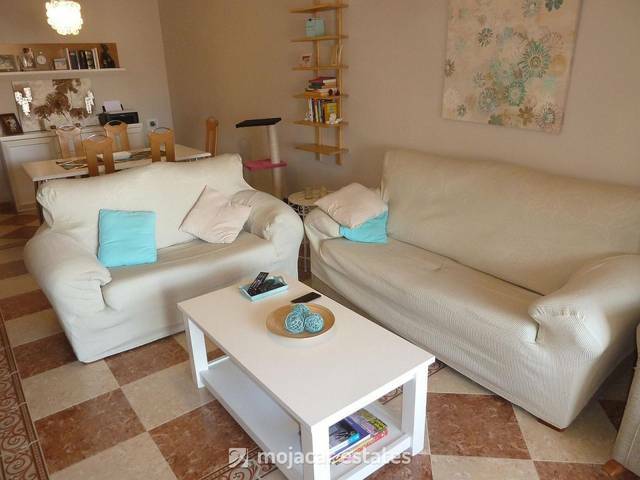 Very close to all amenities, restaurants, supermarkets and leisure areas of Mojacar.